Regardless of your features, it’s always tricky to find the most flattering hairstyle for the shape of your face. In addition to this, some face shapes can be even more challenging than others. Just one example is having a round face, and finding a hairstyle that complements the all around shape. 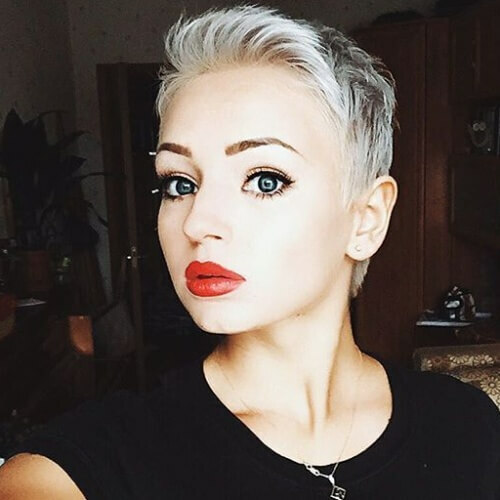 For this, we have handpicked tens of short haircuts for round faces that are sure to inspire you and help you get the hairstyle of your dreams. Want a playful approach to your makeover? Think about getting a short haircut that makes your outgoing side shine. While it may not be the shortest on our list, this flirty long bob is perfect for girls with summer in their hearts. 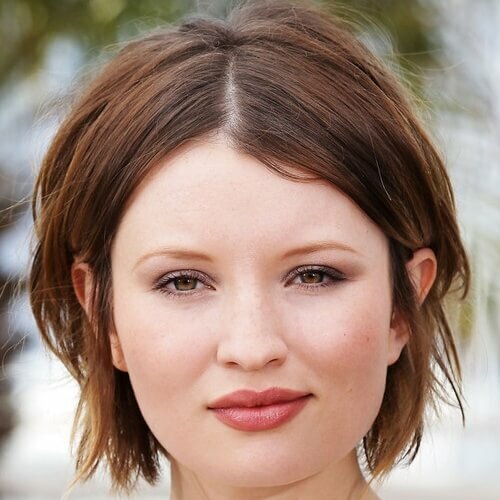 Another bob hairstyle that does a brilliant job of outlining a round face is an A line bob. 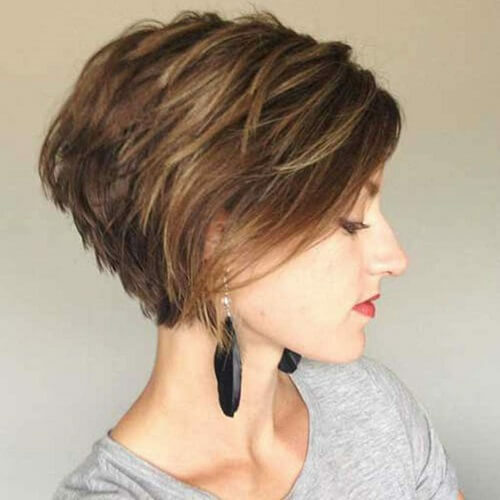 Like the name suggests, this bob features an A-like angle that goes from short in the back to longer in the front. Feel free to play around with the lengths. 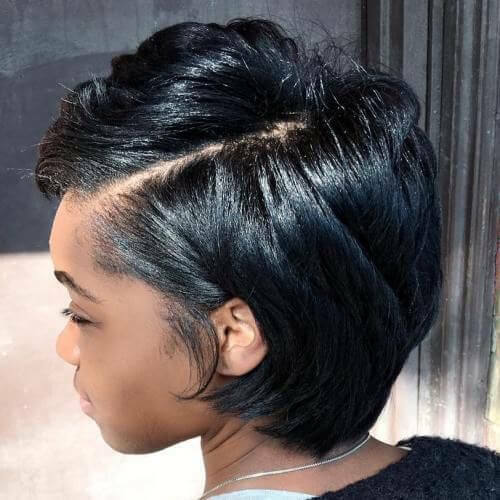 This haircut is a cutie that works amazingly for African American women, but frankly for any gal, regardless of skin tone. In addition to the sweet haircut itself, you can play around with the styling, going from a side part to a middle one. Countless short haircuts look fantastic with long bangs. 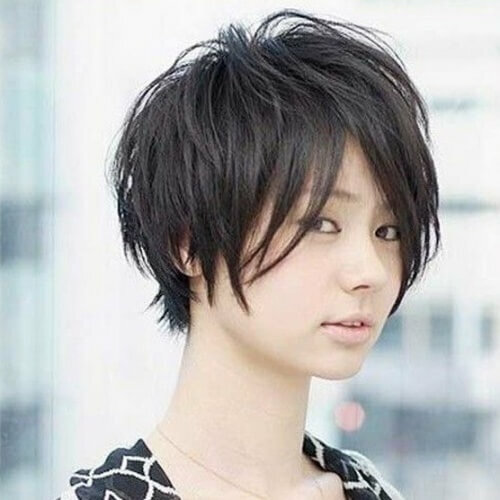 In most cases, the pixie haircut is wonderful for this combo, with longer bangs in the front swept to the side. If you have naturally wavy hair, this is definitely an idea to keep your eyes on. 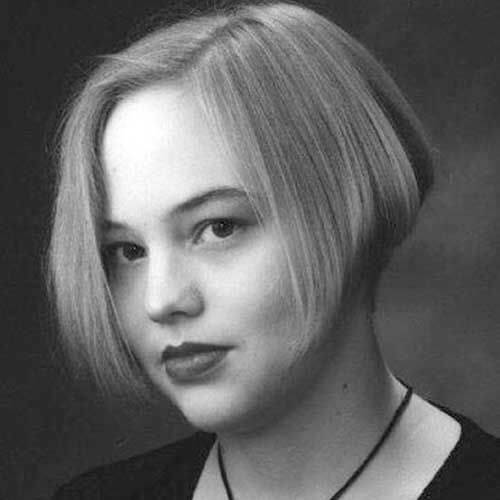 Speaking of pixies, here is one of the classic adaptations of this endeared haircut. We will be approaching it multiple times in our list, as it truly is one of the most advantageous short haircuts for round faces. 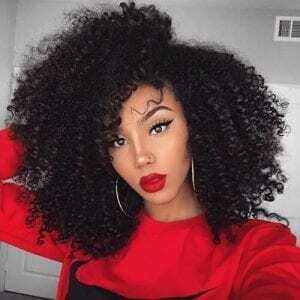 If you have curly hair, you will enjoy styling that requires less maintenance than other hair textures. Your dynamic locks will almost always fall beautifully into place with a short haircut, as you can see in this pretty shot of Jessica Alba. Want to bring out your wild side? Think about short haircuts for round faces with an edge. Women with straight hair can chop away and sweep the rest up with some product. Volume and attitude are just a few of the numerous benefits this hairstyle brings. We’ve talked about A-line bobs, but what about stacked ones? 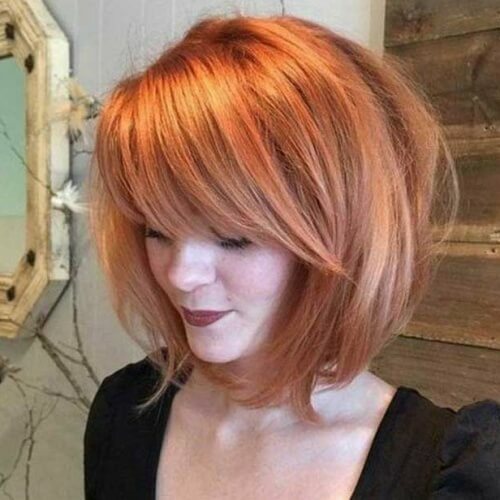 While the contour of this haircut is similar to the previous one we talked about, the stacked bob stands out through heavy layering. As a result, you’ll get an abundance of natural volume. What if you’ve reached a ripe age? There are plenty of short haircuts for round faces that can flatter you. 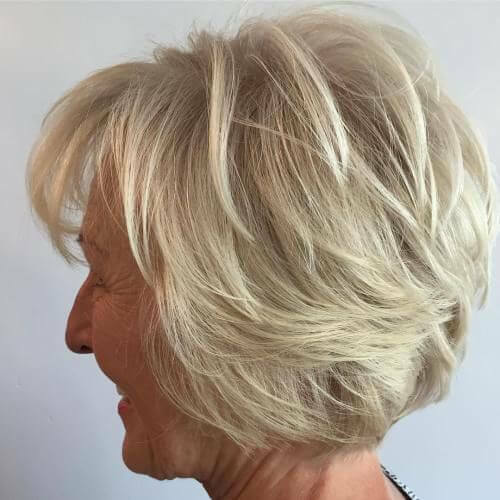 For instance, this feathered bob does an excellent job of creating a pleasant shape, all while being completely age-appropriate. After you get your hair cut, you will certainly be pondering ideas for styling it. If yours is short to medium, you can play around with braided hairstyles. One that works for shorter strands is a messy braided crown. Among the many ways you can properly complement a round face through your hairstyle is to add layers. Any type of layering, whether subtle or dramatic, can have a massive impact on your overall look, from shape to volume and more. What about coloring your short locks? There are multiple ways you can bring your new haircut to life, from colored tips to balayage and everything in between. However, an easy, chic and timeless method is through highlights. On this note, here’s how a lovely ombre job can spice up your short haircut. In addition to the eye candy color blend, you can also be inspired by a haircut idea for contouring your round face. If you have curly hair, this one is for you. Thick hair is always fun to play around with, both for haircuts and hairstyles. Ladies with round faces looking for a short cut shouldn’t shy away from short layers for their thick locks. The outcome will be flirty and fabulous. Here’s another cool idea for enhancing your edgy side. 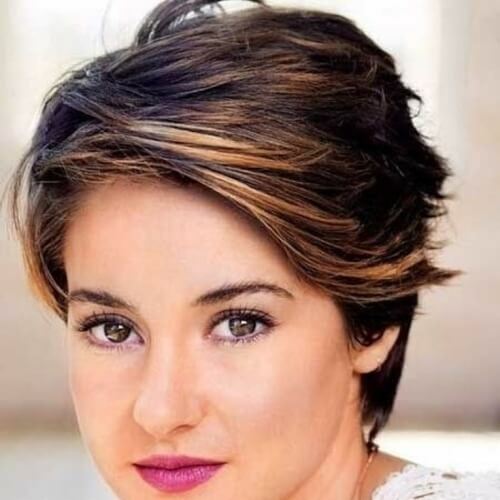 The pixie cut itself is choppy and well-contoured on the side, but what truly makes it stand out is the styling. The edginess comes from the swept up aspect, but gently styling it to the side adds class. If you’re not afraid to go all out with your hairstyle, making it a reflection of your bold personality, think about this haircut. While it makes us think of a mohawk, the hair is left a bit longer and tossed to the side for a punk glam look. 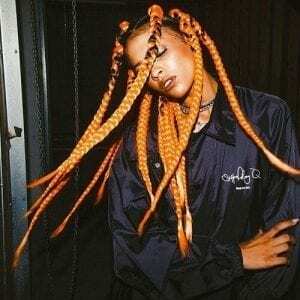 Want to express your fine tastes through your hairstyle? 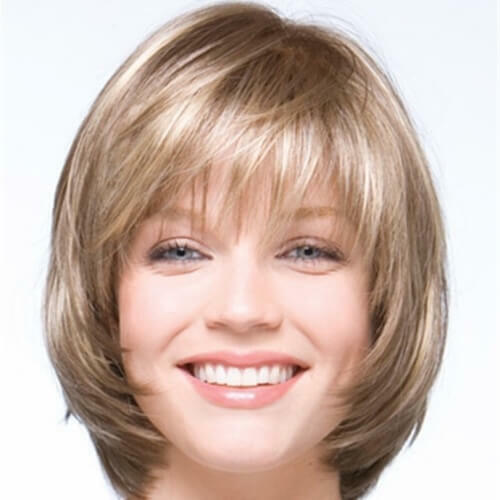 One that will slim down your face and add elegance to your appearance is this inverted, chin-length bob. We recommend it for women with naturally straight hair. If you choose an inverted bob as your base haircut, you don’t necessarily have to keep it sleek. If you tend to be an outgoing individual, don’t hesitate to tease your locks and boost your volume at the same time. We also want to point out the marvelous side bangs in this shot. After talking about thick hair, it’s natural that we would approach the opposite as well. In contrast to thick hair, fine locks may be a bit more difficult to style. Nevertheless, a haircut like the one shown hear can help you get on the right track. 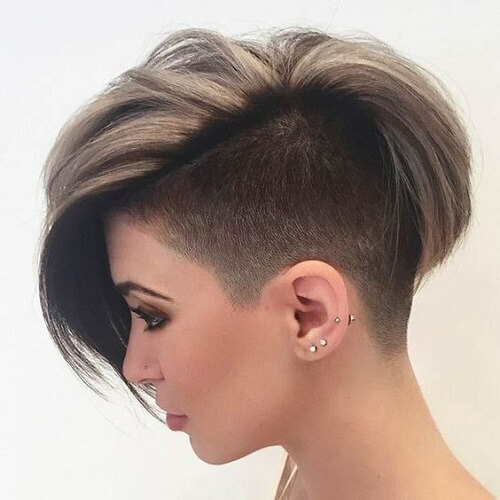 Undercut hairstyles are an awesome way of mixing creative with remarkable. You can rock an undercut in numerous ways, from a discrete 1-inch shave to a steep cut like in this photo. No matter how you choose to get yours, always wear it with confidence. This is yet another entry in which we show off two charming ideas. Firstly, the choppy bob is exceptional for women who long for a sassy haircut. After that, the turquoise ombre is wonderful for making the whole hairstyle shine. 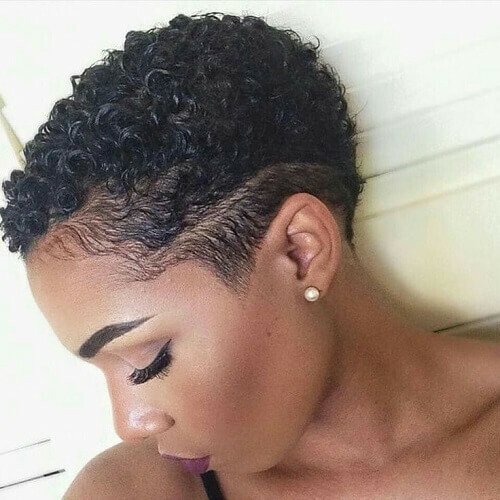 Natural curls are a beautiful sight to behold, especially when they’re accentuated accordingly. If you want to make the most of your curly locks to flatter your face shape, think about chopping them at an angle. We wholeheartedly support natural hairstyles and encourage African American women to explore their plethora of options. If you’re just at the beginning of your transition, you can flaunt a TWA (Teeny Weeny Afro) marvelously. Regardless if you have fine hair or you just want a soft look for your locks, this hairstyle is sure to inspire you. The chin-length hairstyle is strategically layered so the hair falls gracefully on all sides, creating an enchanting outcome. Ladies with thick hair can always rely on short layers for taking advantage of their hair texture. 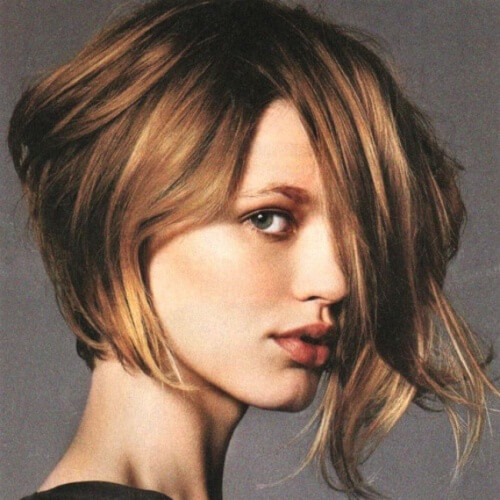 This short haircut has just enough of a shaggy and choppy vibe to make it memorable. All the same, it can be adapted for all sorts of occasions. Not afraid to go super short? Great news! An extremely short haircut can bring out the best in your personality, from your femininity to your fearless mindset. 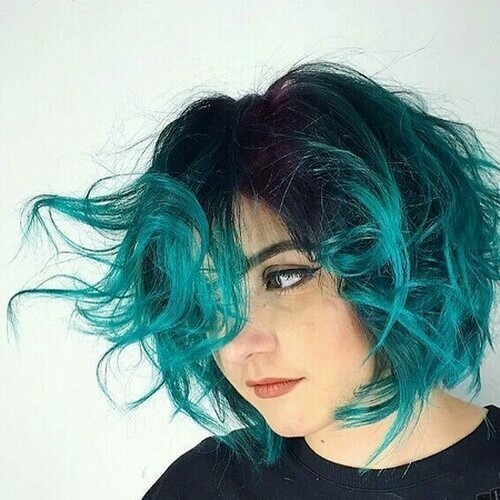 After chopping your locks, you can also take funky colors into consideration. 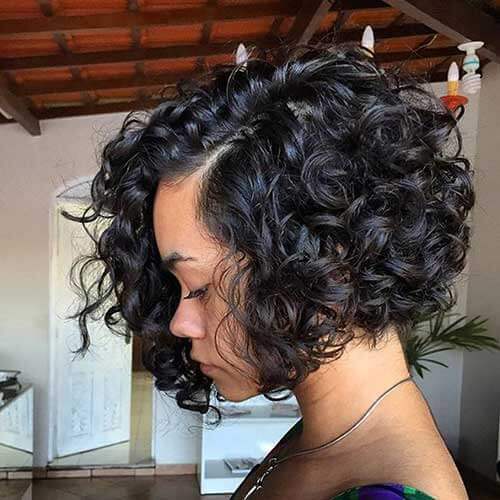 If you’re leaning more towards a shoulder-length approach to your haircut, these vintage curls just may be your newfound love. They’re soft, loose and have a retro feel to them that simply glows with elegance. Another way you can adorn a feathered haircut is by focusing more on the top. While our first example of feathered layering accentuated the sides, here you can see how bangs can appear even fuller with this technique. Whenever in doubt, go for braiding. 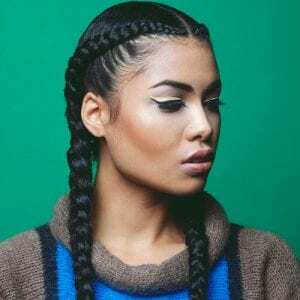 Although women with very short haircuts for round faces won’t be able to nail this specific braid, it’s a terrific idea if your hair is about chin or shoulder-length. Don’t forget the hairspray so it won’t unravel! 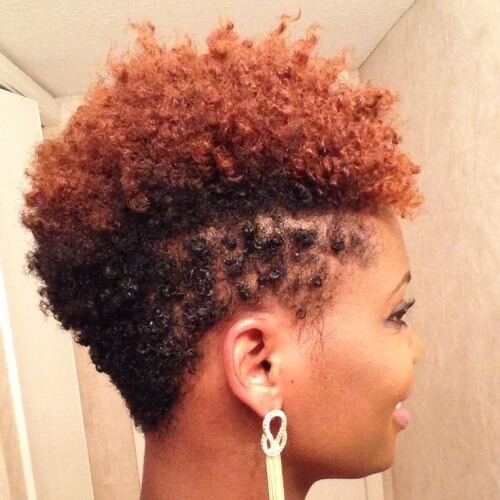 We absolutely love how this faux hawk looks! Spiky hairstyles are always a superb option for courageous women who aren’t afraid to show off their feisty side. You’ll need a bit of time for styling, but the results will be breathtaking. 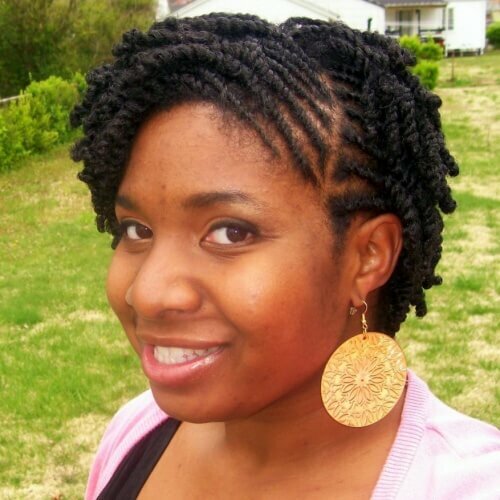 Another natural hairstyle that looks fab on women with round faces is the flat twist. 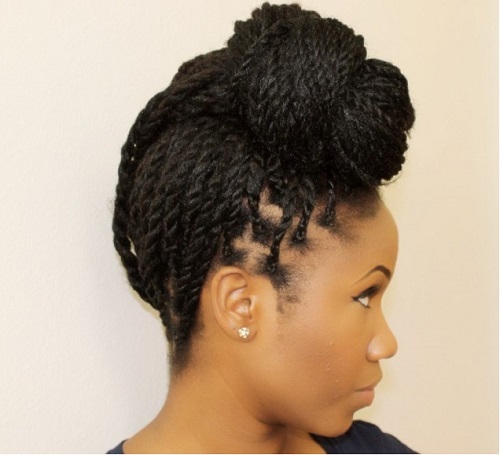 Not only is it chic and classy, but it’s also a hairstyle that will protect your natural hair as it’s growing. Talk about mixing business with pleasure! You can always count on bangs for being the icing on the cake for your hairstyle. Especially when it comes to round faces, bangs contribute to the all-around slimming effect that well-thought haircuts provide. Let’s say you got an A line bob and you’re planning on attending a formal event. While you could always leave your hair down and still be ravishing, wouldn’t you like to switch things up a bit? You can easily obtain this with a half up hairstyle with braided bangs. 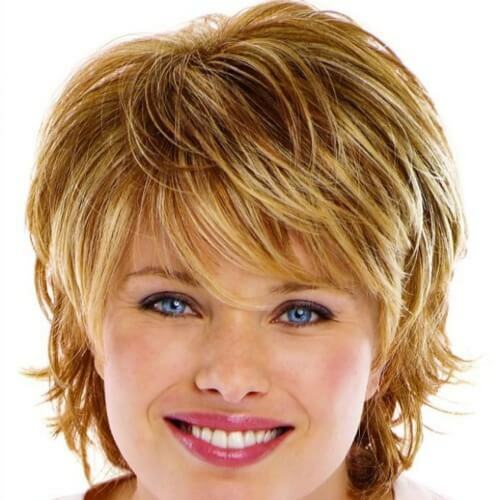 Women with faces that are round and small should think about this particular haircut. 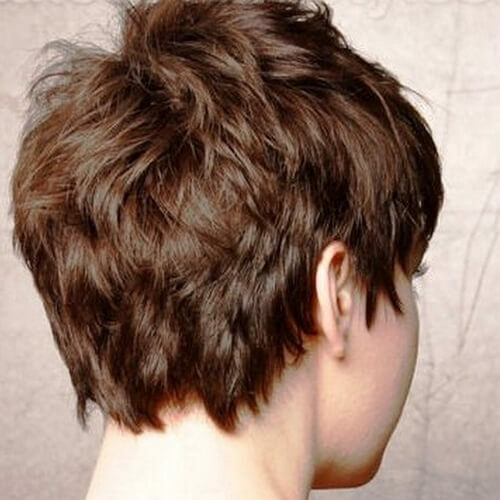 It’s a magnificent example of a choppy pixie haircut, and just how stunningly it can flatter this specific face shape. Alternatively, you can combine your pixie haircut with the idea of an undercut for a rock star appearance. An asymmetrical approach to your haircut will truly make you stand out from the rest, in the coolest way possible. Want to level up your short haircut? Don’t be scared of experimenting with short bangs! This alluring style is perfect for artsy women, or those who generally have a bohemian vibe. To top it all off, you’ll also enjoy a haircut that brings the best out of your face shape. Stacked layered is just what women with round faces and fine hair need, especially if they have reached a mature age. It’s a respectable haircut that highlights the idea of natural volume, simply by getting layers in all the right angles. Asymmetrical haircuts can also be applied if your hair is a bit longer. In this example, you can admire subtle asymmetry, with one side just about an inch longer than the other. It can be rocked in any context, from work to weddings and more. We also love mixing styling ideas, or presented a particular hairstyle in different ways. We have showcased two tiara braids on our list, and this example is how you can take a bit from each for an unforgettable hairstyle. We’re back to round and small faces for this one, with an evergreen pixie that does wonders for women with this face shape and wavy hair. 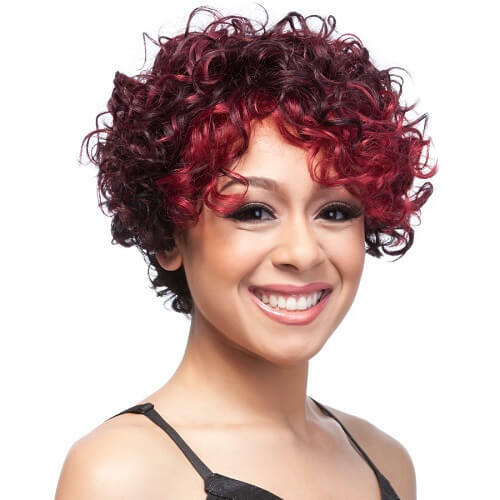 It also features short bangs, highlighting their beauty in a short hairstyle with wavy locks. How sweet is this hairstyle? If you have a choppy bob, you should always remember that small side braids can have a dazzling impact. Whether you choose a French braid, fishtail braid or other styles, don’t forget that two or three bobby pins can help you keep it in place. To prove our point that bobs are fantastic for ladies with round faces, here is yet another sparkling example. The bangs are also a detail that goes a long way for the final results, particularly when gently swept to the side. 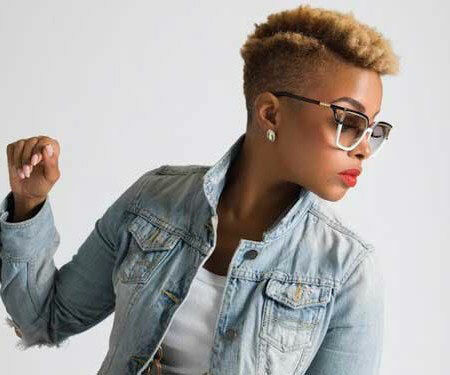 Start building the afro hairstyle of your dreams with a tapered haircut. This technique not only shapes your hair in a memorable way, but it also concentrates your volume in key areas. Plus, you’ll get a mohawk-like outcome. Does time never seem to be on your side? Look for haircuts that require as little maintenance as possible. 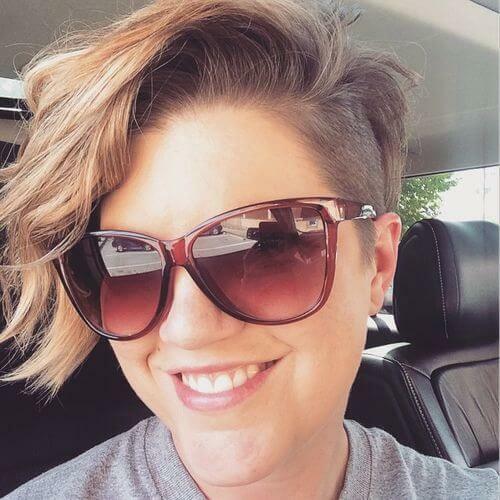 In this regard, the short bob is your go-to option. Style it with a middle or side part and you’re ready to go! We’ve spoken all about choppy haircuts, but what about choppy bangs to match? Aside from the radiant hairstyle you’ll benefit from, it’s also another smart way of framing your face to enhance your natural features. Add a little bit of sugar, spice and everything nice to your hairstyle through textured layering. 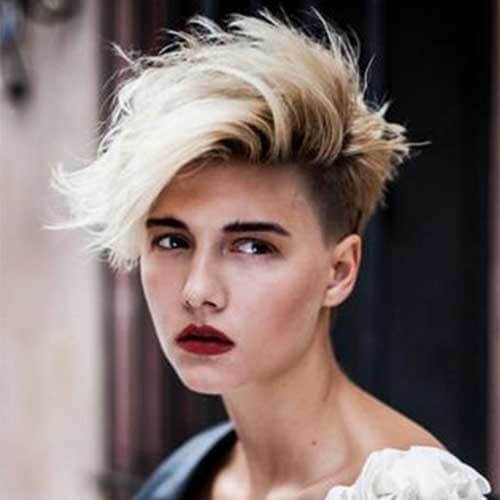 You would be surprised to find out how much the cutting technique matter for the results you desire, especially if you’re aiming for a rugged yet classy look. Although this entry focuses on Asian features, the hairstyle can be rocked by any kind of woman. It has a sublime sense of attitude and confidence, and is ideal for ladies with naturally straight hair. It confirms all of our claims about the power of layers too. Chop ‘til you drop! 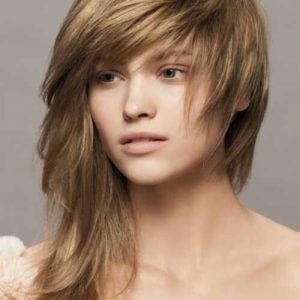 Another idea for an edgy and cool hairstyle is to make your pixie shaggy. We encourage women with thick hair to consider this option, especially if they want to take a walk on the wild side. Getting ready for the most important day of your life? Put as much love into finding the hairstyle of your dreams as you do for getting your wedding dress. This bridal hairstyle will definitely inspire you if you have short hair or are planning on getting your hair cut. 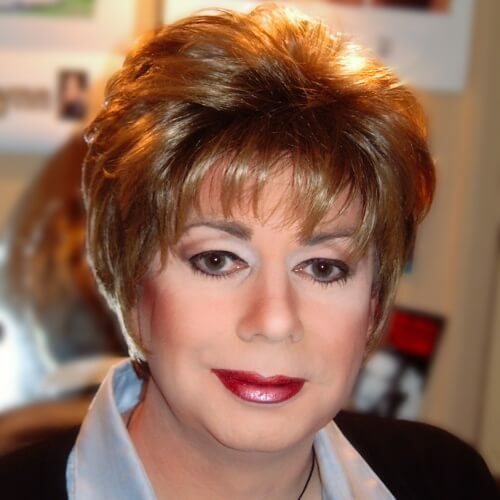 To top off our short haircuts for round faces, we’ll leave you with a final example of a hairstyle for older women. It has everything you could want from a short haircut at a later age, from a low maintenance shape to light and wispy bangs. In summary, the hairstyle you have been longing to find isn’t as far away as you’d think. Although a picture-perfect version requires time and effort for research, we believe that at least one of these short haircuts for round faces will help point you in the right direction. Make sure that your final choice is aligned with your personality, not just your facial features. After your haircut, drop by and tell us all about it in the comments!